Kaneto Shindô's Kuroneko (Yabu no naka no kuroneko, or The Black Cat Inside the Bamboo Grove) – released to great acclaim in 1968 – is a sparse, atmospheric horror story, ascribing to the director’s philosophy of using beauty and purity to evoke emotion. Eccentric and more overtly supernatural than its breakthrough companion piece, Onibaba, Kuroneko revisits similar themes to reveal a haunting meditation on duty, conformity, and love. In this magnificently eerie and romantic film – loosely based on the Japanese folktale The Cat’s Return – a mother and daughter-in-law (Nobuko Otowa and Kiwako Taichi) are raped and murdered by pillagers, but return from the dead as vampiric cat spirits intent on revenge. As the ghosts lure soldiers into the bamboo groves, a fearless samurai, Gintoki (Kichiemon Nakamura), is sent to stop their reign of terror. Kuroneko remains a standout film of the kaidan eiga genre of period ghost stories often based on old legends or kabuki plays. Marking Shindô’s first use of wire work as Yone and Shige battle against samurai blades, the film is subtly complimented by Kiyomi Kuroda’s award-winning chiaroscuro cinematography, Hikaru Hayashi’s vibrant score, and riveting performances from many of the greatest actors of Japan’s golden age of film. 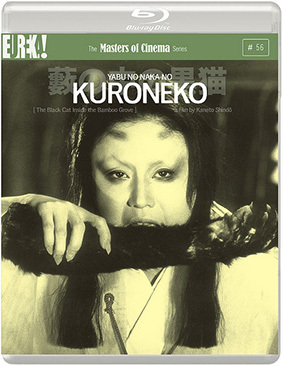 Kuroneko will be make its UK Blu-ray debut on 24th June 2013 courtesy of Eureka Entertainment as part of the Masters of Cinema series at the RRP of £19.99.